My name is Jennifer and I am an addict. Some people are addicted to drugs, some to food, some to love. Me? I’m addicted to music. The majority of my days involve music … listening to it, telling other people about it, writing about it, researching it and just breathing it in. 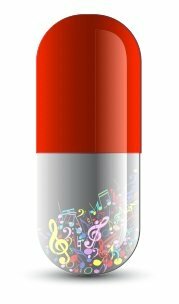 Music is my drug of choice. It gives me a high that I don’t come crashing down from, it fills my heart with a permanent happiness and takes my mind off whatever madness is going on around me. It drowns out the noise of the world and keeps me in tune with my soul. It’s made a difference in my life, one that I am proud of and one that I feel I can share that can help others dealing with situations in their lives. There’s better therapy for a bad day than putting on a pair of headphones and immersing yourself in a good song. My world is full of enablers and dealers. The dealers are the songwriters, the musicians, and the singers. They are the ones who give life to the songs that make me feel good, the songs that keep my mind in a positive place and the music that keeps me sane at times when most people would be pulling their hair out. The writers deal in words and thought. They put down in words what most of us feel but either can’t find the words to say or what we emotionally can’t say. They write from personal experience, tragedy, life’s experiences and sometimes just a drunken night. Whatever means they use to come up with the right words is usually something most of us can identify with, they’re just given the gift of translation that most of us weren’t blessed with. They can then take those words and make something beautiful from them once they add the right notes. This is where the musicians and artists come in, the middle men, if you will, between the dealer and the addict. The deal only happens when the musicians come together to play the melodies and join with the artist to sing the words with the necessary emotions. The final product is a drug that is delivered by the artist who cuts the song and presents it to the addict. The addict becomes hooked and can’t stop listening and has to have another song, and another, and another. And so the cycle continues. Music is a great high, a great way to mentally get away from it all. It’s the kind of high that can literally change your life if you inhale the perfect song at the perfect time. It can take you to a place you never imagined you’d see, take you from a dark place into the light, it can be a key that opens the most tightly closed heart, and it can turn a life around. To quote Bono of the group U2, “Music can change the world because it can change people.” It can and it does, every day. If you have to find an addiction, find a healthy vice in good music. It’s good for your heart, it’s good for your soul. We should all indulge in good music daily and appreciate its long term effects.